Bruce is more than music, he is a medicine for the soul. 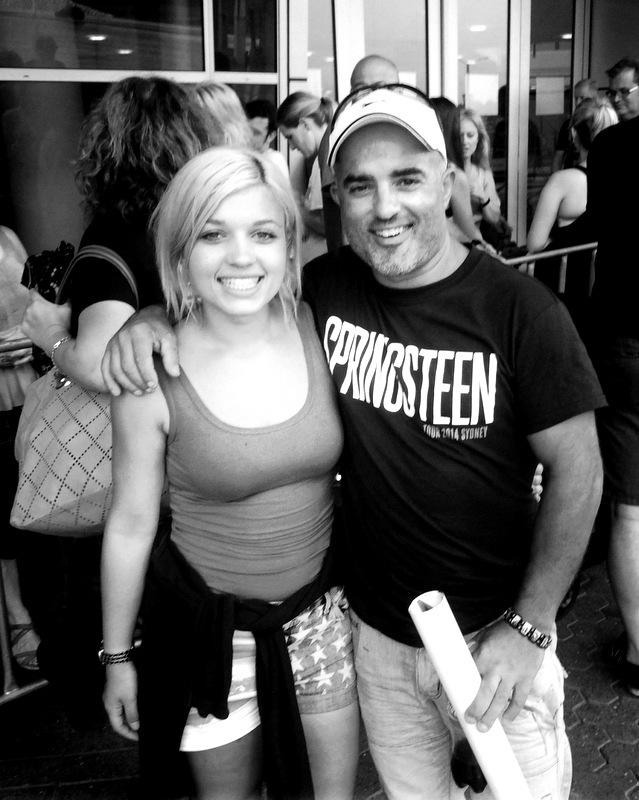 My dad is the culprit of my Springsteen obsession, year by year he slowly increased the dosage of exposure to us children and before you knew it I was hooked. My father fell in love with Bruce Springsteen while he was in high school, he was ironing his shirt for school when Bruce Springsteen came on the music channel and from that day Springsteen has never left his side. My dad is quite the fanatic so I suppose it was only natural one of his three children would be aswell. From as young as I can remember, Bruce Springsteen was always around, he wasn’t unfamiliar he was part of the family. When I was about 5 years old I found myself listening to the Born in the USA album and flipping through the lyric book, there’s an image of Bruce on is toes holding his jacket… I was mesmerized by it. As years went on there was a stage where my siblings and I felt that we were bombarded 24/7 with Bruce Springsteen. My dad would be so excited when a new album came out that it would be played over and over again in the car, oh and let me tell you if there was a lyric that he fell in love with he would rewind it so we could hear that line a few times, to appreciate its beauty.. Someone asked about what kind of music my dad and I like from Bruce Springsteen and if our Tastes in albums are similar. We both love Darkness. It’s a hard question to answer because I have a new favourite each week, I think it depends on how you feel at the time. I know dad loves Cover me when it’s performed live, and Adam raised a Cain is a favourite. He loves when Bruce does his guitar solos. I was exposed to most of Bruce Springsteens music because of my dad and also the solo works of Patti Scialfa and Little Steven. Although it wasn’t until I got a little older and started to experience things through life did I start to go on a personal journey with his music. Being a teenage girl isn’t as simple as it may seem, society has so many high expectations, combine this with a rough childhood and before you know it you find yourself in a rough place. That one thought snowballs and although it was just a thought you end up finding yourself consumed by darkness. You tell yourself you aren’t good enough, you’re not thin enough, you’re not pretty enough, you’re not smart enough and every negative comment someone says sticks with you in your mind forever. You end up hating yourself, putting yourself down , despising everything that you do or see in that mirror. Bruce Springsteens music was my escape, after a long hard day of beating and knocking myself down his music was that little bit of hope that maybe someday everything would be okay and maybe someday I would be able to tolerate myself. Bruce saved me from this depression, he took me way from hating everything about life and taught me that after a storm if you just look hard enough you might just see that rainbow. It’s not worth thinking about giving up, you have to get back up on your feet and find a reason to believe in yourself again. As Bruce said himself from small things mamma, big things one day come.. And they did for me. Something so small as being exposed to his music as a child snowballed and has become a major part of my life and who I am as a person today.